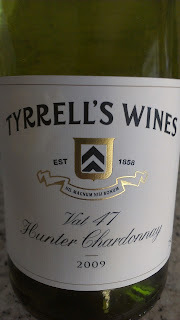 This is Tyrrell's flagship Chardonnay and what a flag it is to fly. Whoa!! Fresh, vibrant, stunning! Three days after being open there was no need to adjust my initial thoughts from a few days prior. Hand picked, hand sorted and basket pressed, the wine spent six months in a combination of new, one and two year old French oak barriques. Aromas are light. Some sweet biscuit and homemade lemonade developed into more varietal traits as the days rolled on. Beautifully balanced, flavours coat the mouth with a delicate texture delivering plenty of interest. Touches of citrus and soft spice dance around. No malo here just natural acid which is bang on target. A striking feature is the oak didn't play its hand until day three. Prior to that the fruit was clearly king. Bumping in as it did really engaged my thoughts on how well this wine will age over the next decade. Stunning! Sure, the $69 price tag may be a bridge too far for Chardonnay fans, but once you cross this bridge, there may be no turning back. 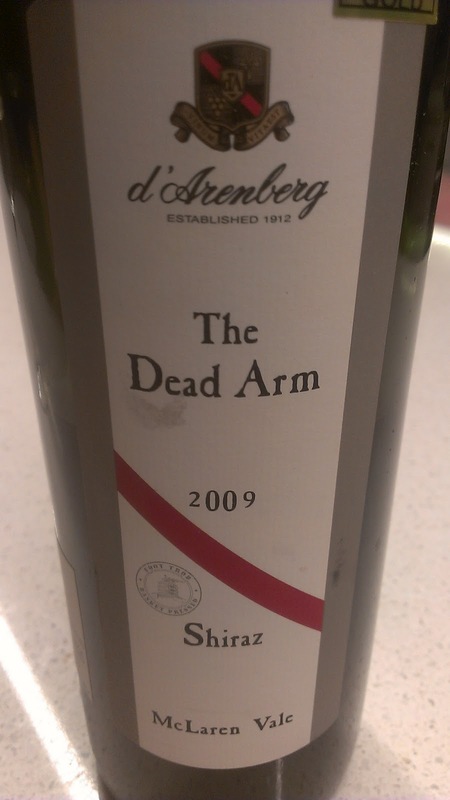 One of a few icon wines which have eluded me over time has been the d'Arenberg The Dead Arm Shiraz. I was very excited when the postman came knocking with this. Regrettably, all those years of excitement where deflated pretty quickly which was very disappointing for me. The wine just seemed to lack life and vibrancy. Typical characteristics were present such as leather, earth, black fruit and even some beef jerky, but the palate was flat an lacked interest. I'm not suggesting that for $70 you need fireworks going off, but I was picturing myself skipping around the room sipping this praising the masses for The Dead Arm. I sat slumped in the chair scratching my head instead. What I tasted just didn't match the price point. Chewy acid and dry fruit, the length was not as plump nor did it arouse much excitement. Three days on there was little to no change from day one. Sadly, not a wine I'd recommend. The flagship of the Pepper Tree range, the fruit comes from vines just over 90 years of age. 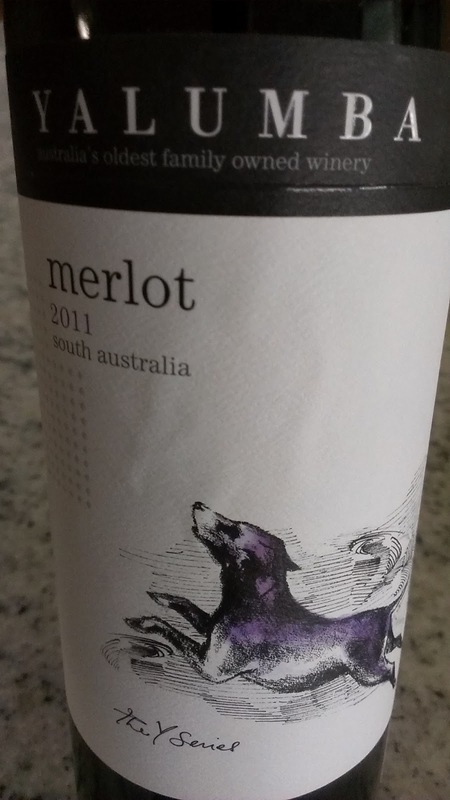 Medium bodied, some unique characters for a Hunter Shiraz which I found intriguing. Mulberry, cherry tart, tobacco leaf aromas. Fruit is good but could be more concentrated. There's plum, spice and it's juicy. I just felt I was waiting for more something special to arrive, only to be stood up. The second day it was open the wine unleashed some beefy and gamey characters. Some oak char chiseled its way through too. I'd be interested to see where this goes in coming years. A wine made to be put away, it nearly seems unfair to make comment on it now so early on during its development. This will do the job beside your plate of spag bol when all you want is to come home and unwind without something complicated after a long day at the office. A pretty simple wine with nothing jumping to the fore. Basic characters of stewed berry, peppery spice and some slight oak. The fruit is light and lacking depth, with some noticeable acid. Peppery spice dominates a good length. Often discounted around the $10 mark, it's not a bad safe option. 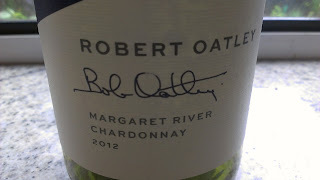 Quite a bold Chardonnay with a firm texture. I couldn't drink too much of this on its own, but coupled with food such as roast chicken, it would slip down much easier. Stone fruit, nuttiness, toast and nougat aromas spill out of the glass along with a good hit of oak. Soft acid is welcomed, but the lack of mid palate fruit is noticeable. Some creamy flavours flow through and I get a sense the wine just needs a little more polish. 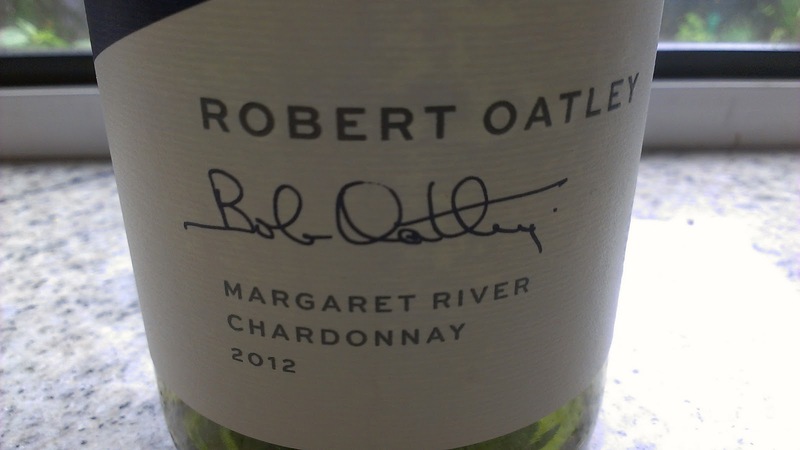 Those who shy away from oaky Chardonnay, I wouldn't suggest this be on your "to drink" list. Personally, not something I'd be rushing out to buy. For pure simplicity and delish factor, damn this is good. A wine that's not going to win a swag of medals, but delivers what the average consumer is looking for...a good solid drink. There's good aromas and fruit to get your senses excited, but for shear easy drinking pleasure, I walked away pleasantly satisfied. 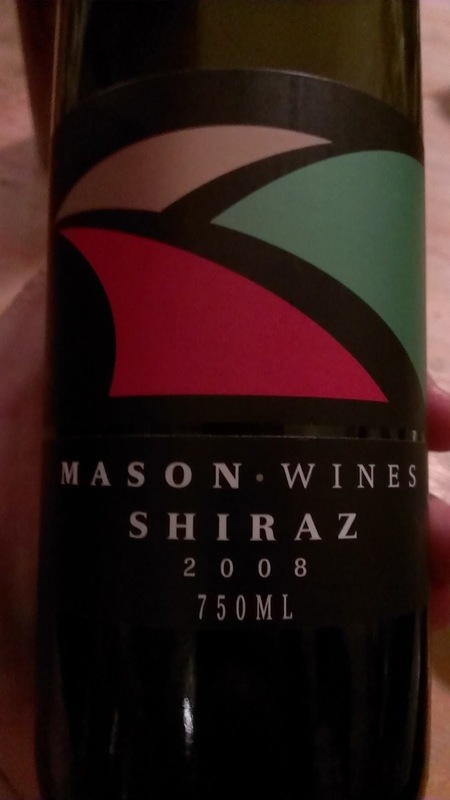 The palate is well coated with blackcurrants, plums, a touch of chocolate and soft some spice. A smooth texture and fine soft finish with good length wrap it up. Not overly dense or concentrated but enough body to do the job. I had it with some Greek slow cooked lamb, a good marriage I thought. A drink now type, have within the next five years. Evans and Tate produce the Redbrook only in the best vintage years. A warmer vintage, the wine spent eighteen months in new French oak (60%) and one to three year old. Plenty going on with this wine and I believe the best of it's drinking is still a year or two away. Lots of black fruit aromas, bay leaf and deep plum characters. Good fruit on the palate with some tobacco hints also kicking around. Some juicy acid and grippy tannin wrapping up in a drying finish. The flavours seemed a little short though, but as suggested, this will certainly be better in a few more years. A keeper but I'm not so sure about the asking price. Dripping with black fruits, this is a wine loaded with oomph yet still has a charismatic softness. 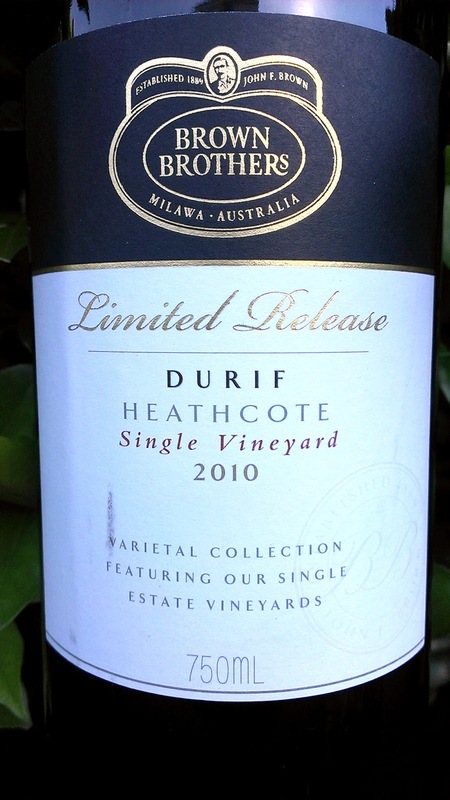 The fruit comes from the Brown Brothers Heathcote vineyards and possesses that unmistakable earthy aroma. 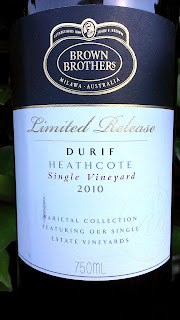 A few sips of this just reaffirmed why I have a secret love affair with Heathcote. Full bodied, the wine also delivers generous flavours of plums and a slight minty edge. There was a dash of spice in there but the wonderful smoothness was the treat. Perfect for a cold night and hearty meal, it's a great wine for the price and will cellar for at least ten years. If you feel the need to stray from the ever popular Shiraz and Cabernet Sauvignon, you may be pleasantly surprised with a Durif. Cellar door or online only. 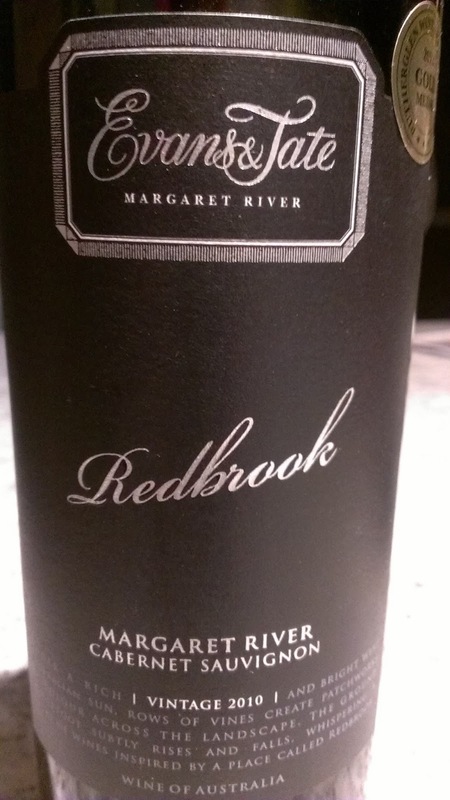 Made by Larry Cherubino and sourced from selected vineyards in Western Australia's Margaret River. Uplifting and fresh characters highlight this wine. Plenty of melon and stone fruit with subtle cashew hints. Beautifully balanced, flavours are full and generous with great length. Oak is present but certainly not king. Very good value. Great to see Chardonnay making a resurgence and looking like this. Look out for it. 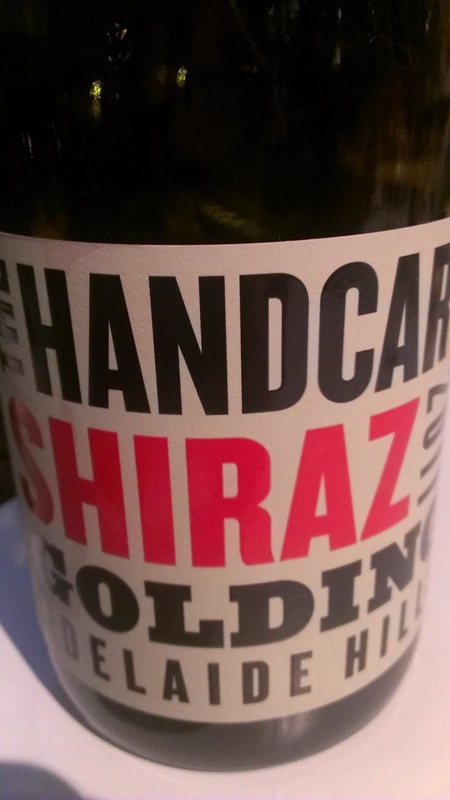 A classic Adelaide Hills Shiraz that doesn't tear a hole in the wallet. Medium bodied, there are aromatic highlights of green peppercorn and cracked pepper spice, even a hint of nutmeg. A touch of minerality, good use of oak and tasty berry flavours rolling through were lip smacking indeed. I did pick up a whiff of sour dough and yeastiness, but the flavours delivered pushed that to the side. The wine partnered my Wagyu pizza very well. It's ready to drink now and will hold out to 2020. Worth grabbing if you see it. There was something that just wasn't right about this wine. But hello day two! What a metamorphosis. Gone was the hard and rough edge with a welcome mat thrown out to a delicious drop, all courtesy of some air to resuscitate it. A blend of Shiraz (44%), Mourvedre (35%) and Grenache (19%), the wine spent sixteen months in new and old French oak. (The percentages came from the website. 2% is unaccounted for). Earthy, red soil like, black pepper and red berry fruit aromas lead to a filling palate. Dried herbs and peppery spice flavours dance about. I even picked up some burnt caramel elements. A drying finish, it was hard to stop sipping away at this on day two. Much more smoother. Much more approachable. Drink to 2020 with a good piece of steak. Sangiovese is such a food friendly wine and this effort from Mike De Iuliis is no different. Initially there was a depth of flavour and mulch type aroma. Bright in appearance delivering savoury and sour cherry flavours. There was a little more grunt factor than I expected, but it appealed to me. Acid was up there but didn't detract from the wine. Day two produced a super smooth wine, a dash of spice still lurking wrapping up with excellent length. It was certainly looking more polished and damn easy to drink. I'd be happy to have this in my glass anytime. The wet vintage of 2011 played havoc in more places than one. Saddening as it was, winemakers have done their best to produce wines though not typical of the variety nor terroir in some cases. The Barossa experienced four times the average amount of rain. This is a very different Grenache to the previous vintage due to the wet. A big gutsy Grenache this is not. The colour is much lighter than you'd expect. A nose of spice, pepper and roasted beetroot. I felt the complexity and depth was ok but no wow factor. This is no fault of the winemaker, you can only work with the fruit you get. Some plummy and cherry characters bounce around on a firm palate. 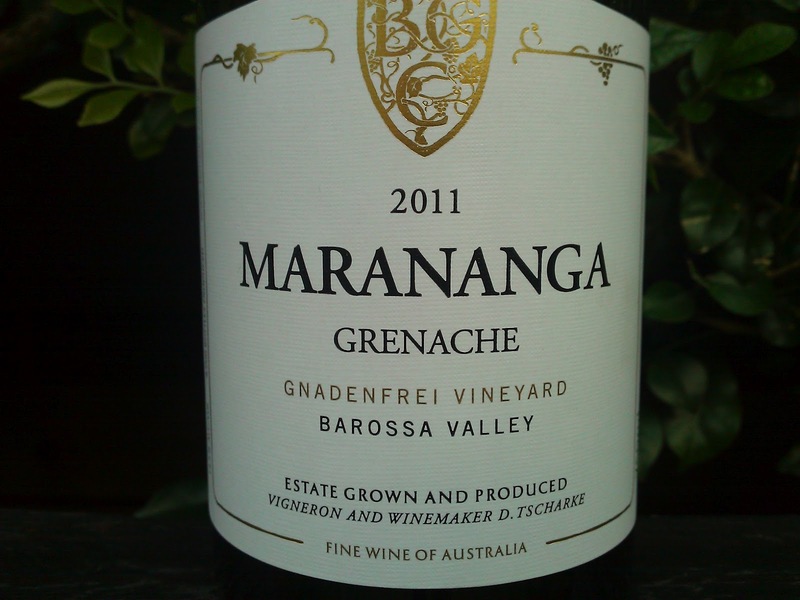 Certainly a more softer style of Grenache, which can also be seen as a positive. I prerfer the bigger styles, but having said that, I know several people who would lean towards this. Those who shy away from fresh and vibrant white wines and seek a one with some body and texture yet not are chardy fans, this perhaps may float your boat. All fruit parcels for this wine were independently barrel fermented before blending. Eight months on lees has added texture delivering aromas of honeysuckle, citrus blossom and creaming soda. Apricot flavours are abundant and the palate weight is not too dense yet it is still bold enough. The fruit appears a little firm though and sits predominantly on the front and mid palate. This wine worked well with a creamy pasta dish. It gets a tick. 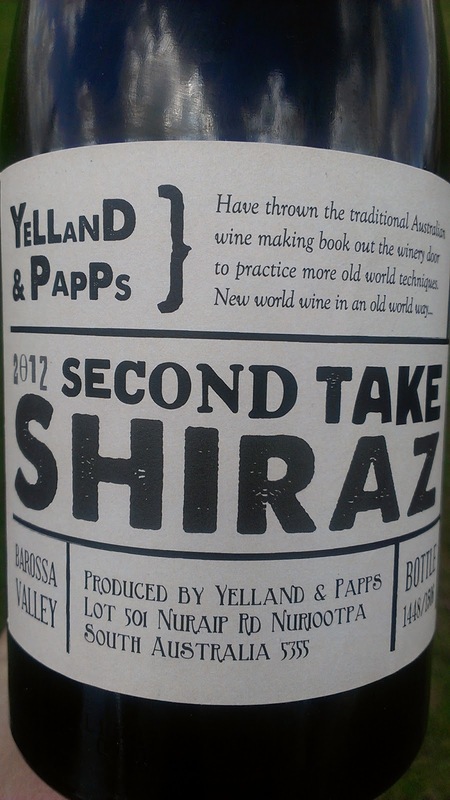 The recent release of the new Second Take label from Yelland & Papps has certainly left me gobsmacked. And even as I keep thinking that the wines cannot surely maintain their high standards set by the previous bottle opened, here comes another. Only 1506 bottles of this Shiraz were produced. Trendy packaging wraps up a wine made from 15% whole bunches which were left on skins for sixteen days. The wine was then left in 45% French oak of which 18% was new. The remaining 55% sat in American oak with only 4% new. Oozing typical Barossa traits, there is plenty of juiciness and generosity being thrown around for you to enjoy. Smells of roast meats and the pan juices remaining throw out an exciting invitation. Packed with plummy and roasted beets flavours, some juicy ripe tannins which keep giving round off a very neat package. My only question was the $40 price tag, but you know, when I look to see the bottle basically empty in quick time, perhaps the price tag isn't an issue. Ready to drink now but will easily hold its form and continue to develop for at least ten years. A ridiculously easy drinking wine. 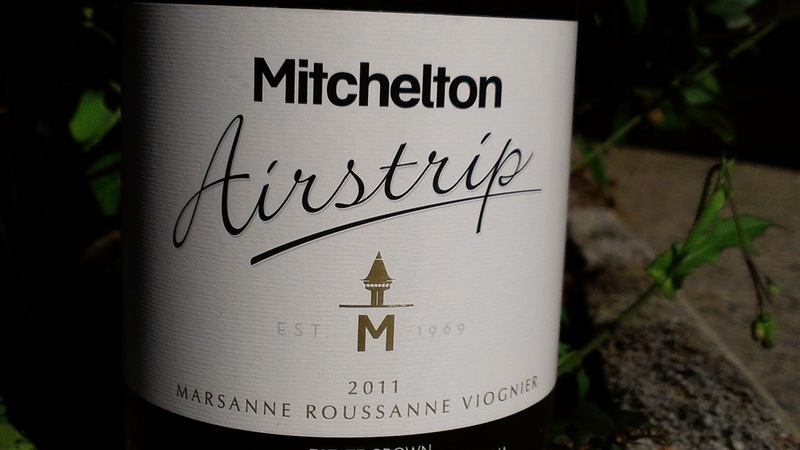 Stand and charge your glasses to another fantastic wine from this small Barossa producer! A 2008 sitting on the shelf for $19? I was intrigued. So off to the counter I went. Soon after I ripped the top off it at dinner. Boom! This blew us away. I was dining with four other wine industry folk and when discussing the wine I asked my well travelled and knowledgeable friend how much she would pay for it. Without hesitation she said $40-50. 'nuff said! 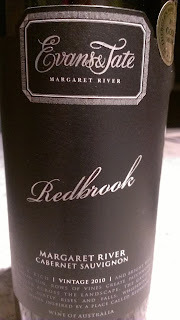 Coming from Ballandean on Queensland's Granite Belt, smoked hock, black fruit and some pepperyness kick things off. The palate is soft and polished with well weighted and balanced fruit. Delicious spice added another dimension. Tremendous length and need I scream, "Value!!" Whether some stock of this remains at the winery or elsewhere is yet to be determined, but if you can get you hands on it, do it! An unofficial "Qld Wine Week" has been on the go 1-8 April, 2013. Wine lovers have been encouraged to grab a bottle of Qld wine and tweet it up. As part of the celebration of Qld wine, a tasting was organised and held at Wine Experience, Rosalie in Brisbane last night. 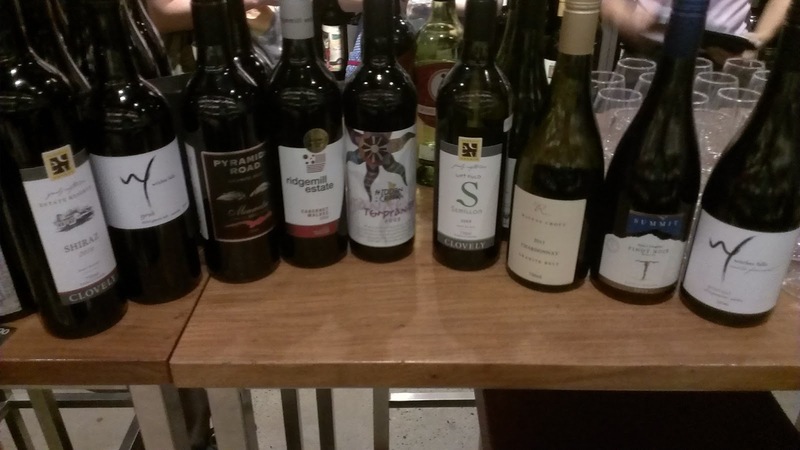 A selection from nine Qld wineries were on show for those in attendance to have a look at. Granite Belt fruit, winemaker Jim Barnes has spent much time working on his Tempranillo winemaking skills. He is on the mark here. Some smokey meat and black olive aromas. There is a little oak poking through the mouth filling fruit. Dusty tannins finish it off. The label is a bit out there, and once you get past that, you are on the right bus. For $22 this is top stuff. Perfect for tapas, ribs and will also accompany your barbecued meat. Hello flavour country. 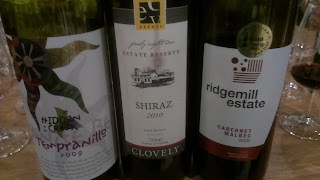 Clovely Estate hails from the South Burnett Region, and if you love your wine big and juicy, give this a nudge. Concentrated and loaded with plummy and chocolate goodness, the fruit is generous and juicy. A super soft finish which is moreish. Damn! 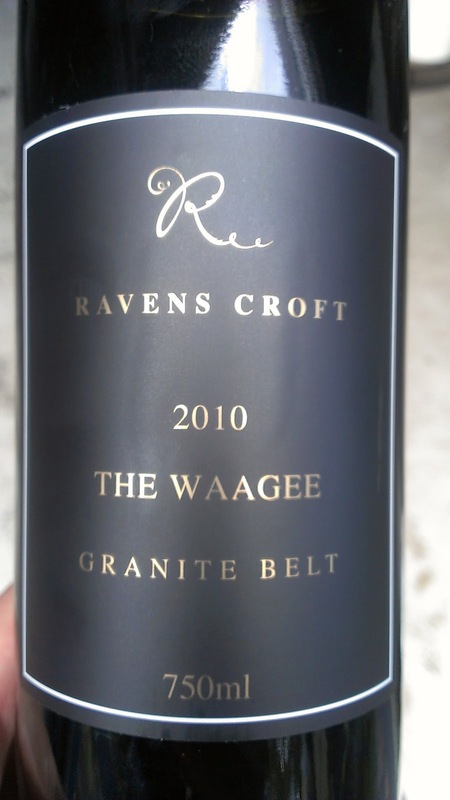 Made with estate grown Cabernet (60%) and blended with Malbec (40%) grown fifteen minutes down the road in Ballandean on the Granite Belt, you can't help but to cuddle up to this drop. The fruit is bang on target. Some mint and black olive aromas roll onto a palate delivering buckets of black fruits. Juicy and grippy tannins demand another sip. There was significant praise for this around the room on the night. Easy to see why. A perfect match for a hearty casserole. 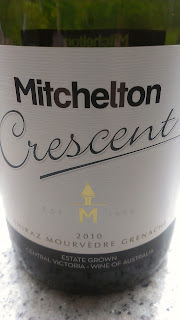 This is Mark Ravenscroft's Bordeaux blend. All the fruit is sourced from vineyards in the Granite Belt area with Cabernet Sauvignon (60%), Petit Verdot (30%) and Merlot (10%) contributing to the wine. Named in honour of his late father, Mark put the wine away for twenty months in new and old French oak. Dangerously moreish, there are buckets of plums, cherries, black fruits and dried Mediterranean herbs in the mix with the oak playing its bit in the background. 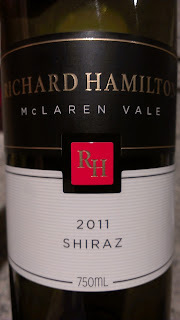 Grippy tannins and a long finish deliver a wine which will improve with age but still holds its own and drinks well now. Deep golden and orange like appearance, there are plenty of kerosene, concentrated honey and dried apricot characters hitting the air. The honey and apricot flowed onto a rich palate with that dried apricot really kicking through the wine. Some acid added zip with the syrupy texture gliding down the hatch nicely. A few years age has brought the wine together and the textural elements made the match with a bitter chocolate tart perfect. But what is rack drying I hear you ask? Bunches are laid out on racks to dry out and concentrate the fruit flavours. 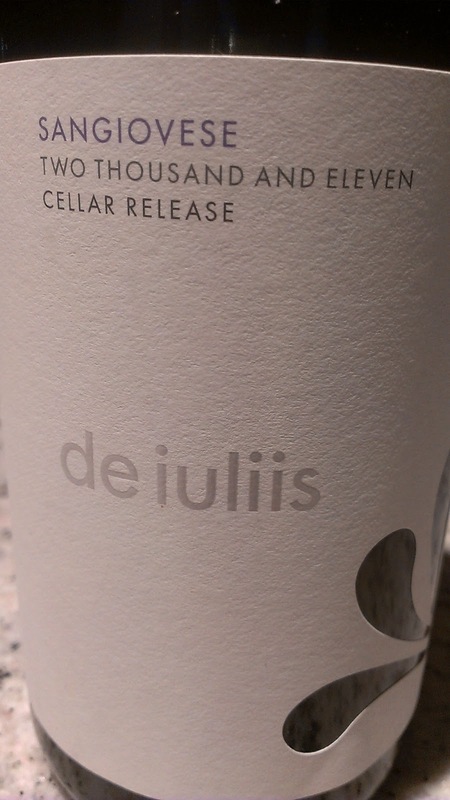 As stated on the website: This wine - from an outstanding 2009 vintage was made from portions of rack and vine-dried semillon grapes. Using the Italian passito method, the grapes were re-fermented with dry semillon wine and aged in French barriques. Winemaker Peter Scudamore-Smith informs me that the Barambah winemaking approach will change its focus in coming years. 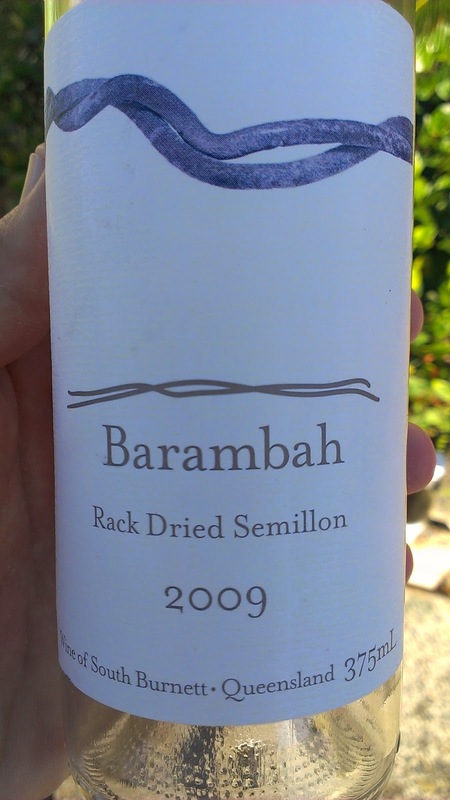 Currently a variety of table wines are made along with this Rack Dried Semillon, the focus in coming years to be Rack Dried Semillon and Rack Dried Shiraz (which has similarities to Amarone). The first release of the Rack Dried Shiraz to be the 2012 vintage and won't be available for a few years yet. This 2009 Rack Dried Semillon is out of stock but I'm also reliably informed the 2010 is better again. 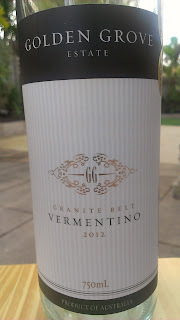 This would have to be close to Australia's best Vermentino. Superbly balanced with excellent texture and length. It's the real deal. 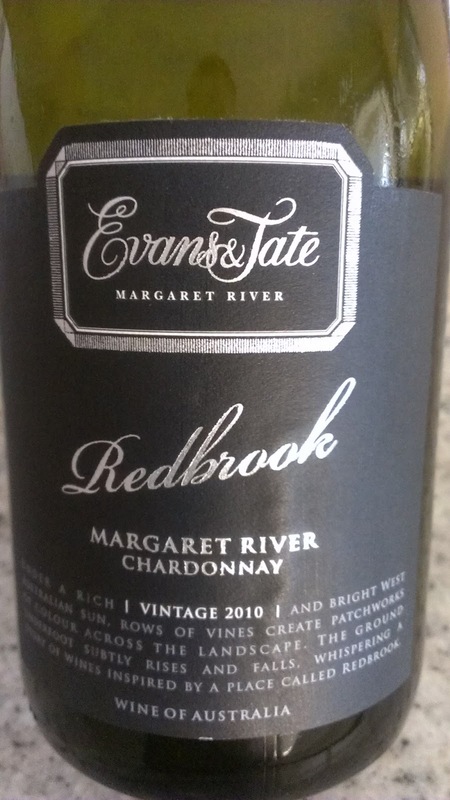 Florally, lemony, limey, and a touch of lemon grass, the flavours are crisp with a slight creamy oak edge. This is a result of the wine being made with some partial barrel fermentation. There is plenty of textural interest and this style of wine leans itself towards richer foods. I had this with baked salmon stuffed with fragrant coconut rice and the match was a winner. 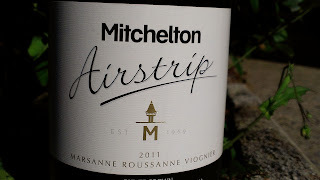 Sensational value for the $22 asking price, you won't be disappointed. Mark Ravenscroft moved to Australia from his native South Africa and settled on Queensland's Granite Belt. Pinotage is as popular in South Africa as Shiraz is in Australia and Mark brought his knowledge and passion of this grape which is a cross between the Pinot Noir and Cinsault varieties. Mark says only three vineyards in Australia currently grow Pinotage. Those being Ravens Croft, Toppers Mountain just north of Armidale in NSW and a vineyard in Inverell on the northern tablelands of NSW. 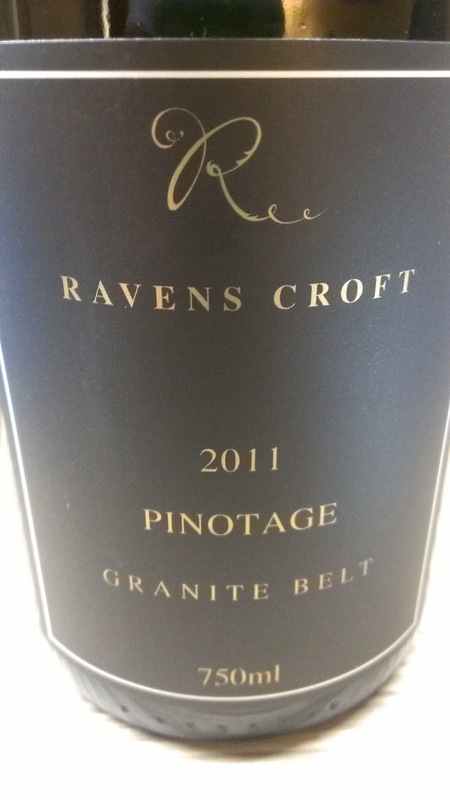 The Ravens Croft vineyard only has Verdelho and Pinotage in the dirt with other varieties sourced from around the Granite Belt to complete his range. Planted in 2007, this 2011 vintage was only the second vintage produced and spent eight months in French oak. 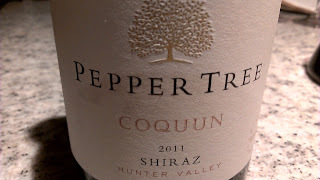 Initial aromas of dry tea leaves, black olives, and some black fruit, there is very much a savoury element to this wine. There are some absolute similarities to a mix of Tempranillo and Pinot Noir going on here. Flavours are concentrated on the mid and back palate and deliver a lovely mouth warmth. Still a little tight, a few more years age will bring out the best, although this still drinks well. Super smooth with a silky finish. 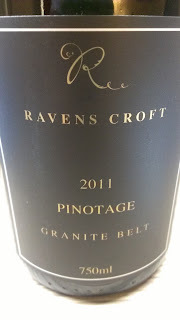 I shared this with a self-confessed Pinotage freak, who after initially believing Pinotage was not made in Australia, he turned to me and nodded with approval, "Now this is good Pinotage." The bad news is the 2011 is sold out, however, the 2012 ($40) has just been released in recent weeks with only 500 bottles still available.